I have always been interested in the amazing benefits of essential oils, but to be honest essential oils is not something that I am super familiar with. 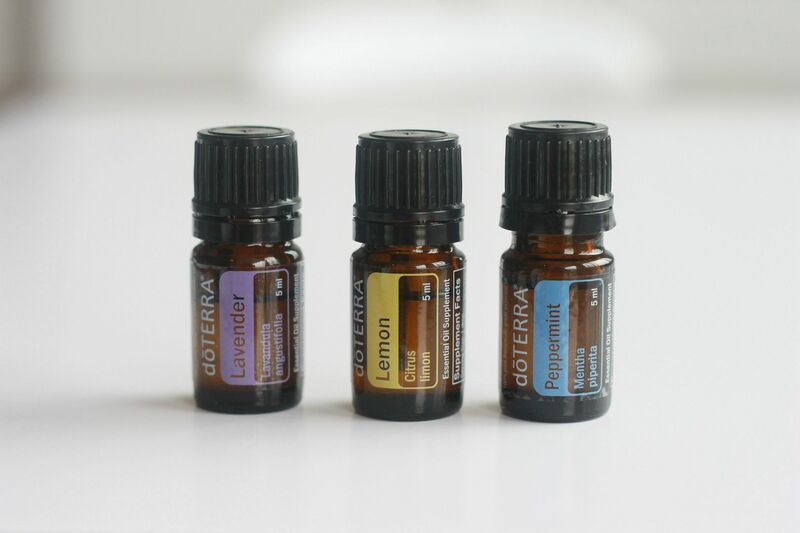 Amy, who is a sweet blog reader recently contacted me and offered to send me a few of the doTerra essential oils she swears by to see what I thought. She also sent me all the information that I could ever need as to how exactly you can use them. I have now been using the oils for two weeks and I LOVE them. I especially love the lemon, which has given me a natural boost of energy in the am when added to my water. So today I am going to share my top 3 favorite oils that I have tried, along with the benefits and how you can use them. Use to calm reaction to bee sting or bug bite. Add a few drops to a spray bottle for a natural cleaning agent. Lavender’s antibacterial, antibiotic, antiviral, antiseptic properties are great for spraying around your house. Apply to wrists or inhale when traveling to ease motion upset. You can warm lavender (don’t scald it), mix with olive oil and gently massage around the ears (not in the ears) and near glands in the throat to help relive earaches. Add a few drops to lotion for stress relieving effects. Apply to dry chapped lips before applying lip balm. Add a drop to your water in the am for cleansing effects. I have been doing this daily now love the way it makes my water tastes and the natural burst of energy it gives me. Apply topically for mood elevation. Add a couple drops to warm water & honey, which can help combat a sore throat, slow a nasty cough, and douse a fever. Lemon oil fights bacteria, as well as viruses. Apply directly to cold sores for soothing relief. Remove gum, label adhesives and greasy substances from fabric. Okay people this is magic how well this works! Use to clean kitchen counters and stainless steel appliances. Use it in baking. Amy said she makes delicious lemon cookies with it and I can not wait to try that! Rub on stomach or feet, or take internally to calm indigestion or upset stomach. Mix with the lemon essential oil for a refreshing mouth rinse. Add a drop to your tea to relieve heartburn. Diffuse or apply topically to open sinuses and airways. Mix with lavender to sore muscles or joints. Apply topically for fevers and headaches. Inhale as a non-stimulant pick-me-up on long drives. Add a few drops to shampoo and conditioner for a refreshing hair and scalp treatment. Use with lavender and lemon during allergy season. Use in baking. I'm thinking I need to make some peppermint fudge with it asap. Even though it may seem like I just listed a million benefits there are literally hundreds more. And now for the giveaway! Today one lucky reader has the chance to win all 3 oils mentioned above. Leave a comment below saying which oil you are most excited to try. The winner will be selected at random and notified by e-mail this Friday. * If you do not want to wait to see if you won, you can purchase all the doTerra oils here. Lavender is one of my favorites. I would love to try the Lemon scent. Thanks for hosting this giveaway! I love essential oils! I'm most interested in mixing the peppermint and lavender - so calming! I would love to try the lemon, I have heard so many good things about DoTerra! I can't wait to try them all, especially lavender! Lemon! They all sound so handy and clever. Peppermint, I always love peppermint!! I would love to try the lemon essential oil! I love the scent of lemon. The lemon oil sounds amazing! lb- Yes! That would be so yummy! It would have to be lavender, it's great for acneic skin! All three are my favorite!!! I love lavender on my sheets, lemon for my kitchen counters and peppermint well for everything! I am not sure which one I am more excited to try, I have been wanting to start using oils and this would be a great way to start. Lavender would be my favorite! I get cold sores and use Whole Foods peppermint oil on my lips and find it works better than any other medicine. I've been dying to try out doTERRA to see if it would work even faster but was scared to invest the money without knowing it was better first. Thanks! Haha. I need to try the lavender on Mila and Phoenix! I love lavender. Years ago, I was super stressed as I was in grad school and working full time with odd jobs on the side. My dad bought me a little vial with lavender to dab on pressure points to relieve stress. It was amazingly helpful, and I'd love to try these! I would love to have the peppermint... my sinuses have been acting up lately and it would be so great to breathe free and clear! I've been hearing so much about the doterra oils lately...Id love to try to lemon oil for an energy boost and help with a nasty cough! I am most excited about the peppermint oil. I've been using lemon & lavender a lot lately, but really want to try peppermint! They all sound great, but l am most excited about the lemon!! All three for allergy relief! My cousin has experienced great allergy relief using essential oils, now I am anxious to try it. I love all of those scents but I think I like the benefits of the Lemon one the best! I'm a huge fan of lavender! I also pinned the link to your blog! Super excited about this giveaway, thanks for hosting! I would love to try the lemon oil...anything lemon has my vote!! I would love to try the lavender! I love anything lemon - citrus rules! I would LOVE to try the lemon one! Who knew you could bake with it?!?!?! I would love to try the peppermint to see if it could clear up my congestion! Dying for the lavender! Perfect for my babe! Peppermint! Would love to try this time of year to help open up my airways when I'm stuffy at night. peppermint oil!! Want to make peppermint coffee! im most excited to try the peppermint! These all look fantastic! I can't wait to try them all!!!! If i had to choose it would be lemon. I've found that citrus has a very energizing effect on me. Great post, I was unaware of the many uses for essential oils, I didn't know you were able to ingest them! As for which one I would be most excited to really, its a tie between lemon and peppermint, I just love them both so much! We are huge fans of essential oils! Would love to try peppermint especially with the holidays coming up! Thanks for a fun give away! I have been dying to try doTerra, definitely peppermint! I would like to try the lavender for stress relief! Love Lavendar! Lemon would be nice too. I love lavender, Lemon would be nice too. I would love to try to peppermint, as I've had so many headaches during this pregnancy! As a person who experiences migraines and headaches quite frequently, I'm most excited to try the peppermint. Oooh, I want to try the peppermint! I'm most excited about the Lavender for natural cleaning purposes, but they all sound lovely! I'd love to try the Peppermint for indigestion! I've just read that some cultures believe lemon can lower blood pressure. Worth a shot! I am going to have to try lemon. I never even knew that it was an essential oil. I would love the peppermint! Peppermint! I'm obsessed with anything peppermint and using it as a hair & scalp treatment sounds amazing. I'd love to try lemon! And the combinations! I'm so excited to try lemon. I never thought of putting it in my water! Love! The peppermint to help relieve my sinuses! I can't wait to try lemon in the water...so excited! wow! i have never not wanted to win a giveaway more than this one. i am weaning right now and have wanted to get into essential oils for me and my son once we are done nursing! the lavender would be amazing. I'm excited to try lemon! I LOVE all things lavender, so I'd love to try that one in particular. Good Day!!! Im most excited about the Lemon oil!!!! i would love to try the lemon, i think it would be great to have for the upcoming flu season to fight off the illness and protect all the surfaces in my house! I already love all three, but I just learned that lemon may be the best oil for "what ails me." Thank you for the giveaway! I can't wait to try the Lavender! I want to try the lavender! I'm having a hard time deciding...i have reasons I would love to try all of them! I'm a sucker for all things lemon so I think i would probably use that one the most! I love the smell of lavender, but didn't know it could be used on chapped lips. With this weather, I can't wait to try that! I love the smell of lavender but I wuld love the peppermint one as well! Thanks for a chance to win! I'm not sure if this is open to Canadians, but I'd be excited about the peppermint - I bet it would be great for candy cane cookies. Peppermint! I love all things peppermint. Lemon! Was thinking it would make my clay mask smell delicious!! Lemon! I want to try it in my water. I use lemon oil to clean but mine is not therapeutic grade so I don't feel comfortable ingesting it. Would love to try this brand.